The Cuban farmland opened up new windows of opportunity for my work. From 2001 to 2005 I spent long periods of time with them. I made new friends while wandering in this unique landscape that strongly reminded me of my Sicilian countryside. I returned regularly to visit my friends Fidel, Miguel, Jose, Inesita and their families. Our interactions allowed me the opportunity to experience and photograph intimate rituals such as working in the fields, sharing meals, smoking sugar-tasting cigars rolled before my eyes by Fidel’s skilful hands, sipping sweet rum shots as we conversed about the sowing and the harvesting of crops and about our families and our existence. My way of shooting changed. Taking pictures became almost part of this ritual-it was no longer the main priority, just a component of this rich exchange among human beings. The singular apparition that is Bazan Cuba is not what just any camera would register, but Ernesto’s way of seeing, and no one else’s. Of the thousands of pictures of Cuba by Cubans and foreign photographers, none that I know look very much like these. The images here are stamped throughout with the photographer’s name, his perceptions, his mind, and they tell a story that belongs to him alone… He traveled to Cuba several times from 1992 to 1997, fell in love there with Sissy, a Cuban, married in ’97 and made the place his home. Ernesto Bazan was born in Palermo, on the island of Sicily in Italy in 1959. He received his first camera when he was 14 years old and began photographing daily life in his native city and in the rural areas of Sicily. Photography has been more than a profession: a true passion, a mission in his life. At the age of 19, he went to New York to study photography at the School of Visual Arts from where he graduated in 1982. Bazan has published several books: The Perpetual Past, Passing Through, The First Twenty Years, Island, Molo Nord. In 2008, his recently created publishing house BazanPhotos Publishing recently released his new book BazanCuba on 14 years of life and photography on the island. In May 2009,the book was awarded Best Book Of The Year at the New York Photo Festival. 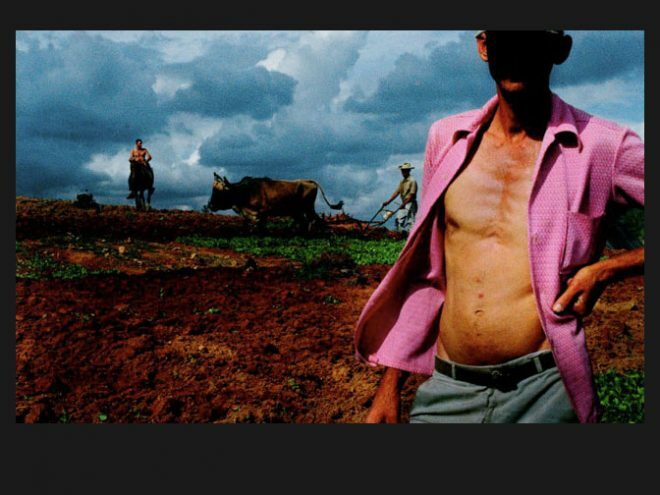 His next book Al Campo, an in-depth exploration in color of life in the Cuban countryside, is due to be published in 2011 by BazanPhotos Publishing. He has had exhibitions in Europe, Latin America and the United States. His photographs have been collected by collectors and museums among which MOMA and ICP in New York, SFMOMA in San Francisco, the Museum of Fine Arts in Houston, the Center for Documentary Studies at Duke University, Durham, the South East Museum of Photography in Daytona, the Fondazione Italiana della Fotografia in Turin, the Biblioteque Nationale in Paris and the Musée Réattu in Arles. From 1992 to 2006, he lived and photographed the island of Cuba documenting the unique time in Cuban history called The Special Period. This body of work has given him the privilege to win some of the world most prestigious photographic awards among them The W. Eugene Smith grant; the Mother Jones Foundation for Photojournalism, the Dorothea Lang Paul Taylor prize at Duke University, N.C., the World Press Photo and two fellowships from the Alicia Patterson Foundation and the Guggenheim Foundation.